Blessed with an abundance of lakes and rivers, the area around DesBarres Manor is a paradise for trout and salmon anglers from spring through to fall. Here are some of our favourite fishing spots and the best times of the year to land the big catch. DesBarres Manor is centrally located among some of Nova Scotia’s leading salmon fishing rivers including the Salmon, St. Mary’s, West, Margaree and Mira. The Salmon River is only a 10 minute drive from the Manor and has one of Nova Scotia’s longest seasons for estuarial salmon fishing, from May 15 to September 30. Every day of the season, regardless of water levels, arrive at the river outlet for the last two hours before low tide for excellent fishing. The Salmon River is also a good spot for brown trout. New York Times writer Nelson Bryant wrote about his Atlantic salmon fishing adventure on the Salmon River. Click here to read the article. Most rivers in the area are fall rivers requiring the heavy rains of October to bring the salmon in. The South and West Rivers are best in September and October after a rain. The Margaree has an early run in June and generally a late run of larger fish in September and October. The Baddeck, Middle and North Rivers are similarly late rivers for salmon. Trout are abundant in the many local lakes and rivers around the Manor. Most lakes will require a boat. April 15 to June 15 is the best times for Trout due to cold water conditions. Roadside brooks and streams also provide enjoyable fishing for brook trout all summer long. 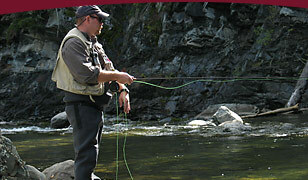 The Salmon River is an excellent fishing spot for brown trout, usually after low tide.